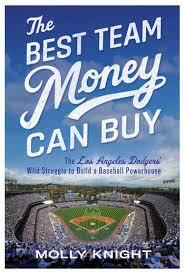 The Best Team Money Can Buy from Molly Knight was a good read subtitled The Los Angeles Dodgers Wild Struggle to Build a Baseball Powerhouse. The book was published in 2015 and covers the events leading up to the 2012 sale of the Dodgers by Frank McCourt to The Guggenheim Partners led by Mark Walter and then heavily focuses on the 2013 season and a bit on the 2014 campaign and it's aftermath. Knight starts things off with a story of her going in January 2014 to Clayton Kershaw's Dallas-area home and being there when news broke of his seven year $215M contract extension with the Dodgers, and then after this, she begins the main part of the book by chronicling the dysfunction of the team under Frank and Jaime McCourt prior to their divorce that ultimately forced the sale of the team. She covers the mega-trade towards the end of the 2012 season for Adrian Gonzalez, Josh Beckett, and Carl Crawford from the Red Sox, and details well the following season and it's key contributors, including manager Don Mattingly, along with players Zack Greinke, Matt Kemp, Hanley Ramirez, Kenley Jansen, Gonzalez, and especially Kershaw and Yasiel Puig. It's a solid book about interesting characters, but suffers the fate that many sports books do in both aging quickly, and not having the most compelling finish possible, with a comparison being the Tom Verducci book The Cubs Way that was published in the offseason following Chicago's historic 2016 World Championship.